Yeah. So as I said in my last post, what exactly did I do in that single Sunday that came in between. I went to Gateway of India, side by side with The Taj Hotel, followed by the Elephanta Caves. That's Taj in the backdrop of Gateway of India! Lemme tell you about the caves in my next post. I guess that’s gonna call for 2 parts. India Gate was constructed to commemorate the visit of King George V and Queen Mary in 1911. Pretty new, rather very very new in terms of Indian history. 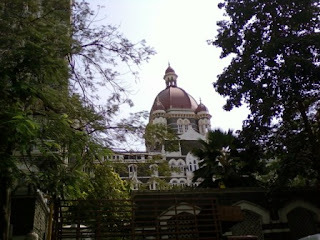 The building is 26m high and was built by the then Indian Govt under the English rule. This is a mix of Indian and Mughal architectures. 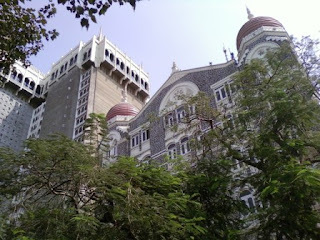 The Hotel Taj is located just beside Gateway of India. This has 2 wings. The heritage and the new one. The heritage one was built in 1903. This building is a perfect blend of European, Indian and Mughalay architectures. Being next to the Gateway of India, this provides the perfect views of the sea from within the hotel. Wish I could go inside atleast once and get myself lost in the architectural beauty and charm of the hotel. This is a different angle of Taj from the behind. This is the same old Taj rebuilt after the destruction of Terrorists. From here ferries are available to go to Elephanta Caves. So did I go there.? Coming soon!!! Can take a cab from the station. Mumbai taxis run in metre charges. P.S. May God hold the ones who were preyed upon by this blast close to him and may God take care of the survivors and the friends and relatives of the deceased ones to heal their scars physically and mentally. More than them, may God cure the psychiatric mental illness of terrorists and make them quit terrorism!!! Whenever I come to your blog, I am itching to travel to India. Hopefully very soon. Nice post as always.. I haven't been to Mumbai and would love to see these with my own eyes, but until then, thank you for the great shots! Magnificent snaps. I love this place very much and had been here few years back. Hey i just came back from a trip to Valparai & Athirappilly ,can i post about the trip here if you dont mind ?????? Pictures and text are just beautiful! Great post! Very nice pictures as well. You surely had a wonderful time in India, right? It is really a good place to visit especially for tourists because of the many destinations and spots there. It's an experience of a lifetime! Thanks sweetheart. How come you found it was my birthday!!!????? Then what stops u... Pack your bags and come here now itself...!!!! Come here dear.. Once again. You'll fall inlove with India all over again!!! You globe trotter!!! How come you've never visited Mumbai!!!????? Why dont you post in your blog?